All of our shower drain covers are made from reclaimed 304 Stainless Steel which means they will never rust, fade or tarnish. Designer Drains has built a name for quality shower drains, cabinet hardware and sink stoppers that are manufactured in the USA. We are more than happy to help you get the correct style and size as we know how crazy and hectic any remodeling can be. Throughout our society, there are examples of creations used in our home every day that were born not out of necessity, but from refusing to settle for what was readily available – and thinking outside the box to create something new. For example, the DRAIN COVER. Never thought of as an important aesthetic component, this centerpiece of the shower or bathroom has long been overlooked by its manufacturers. Until NOW. Designer Drains™ was born out of the need for something different. While remodeling his own home, the founder of Designer Drains; Peter, was dissatisfied with the drab options that he was presented with for his bathroom remodel. He searched around trying to find the perfect fit for his architectural vision but there was nothing. So, being an artist and inventor afforded him the perfect opportunity to create something that he would love for his newly refurbished space. We are continuously improving the level of luxurious living among our customers by providing beautifully crafted products for the home. By leading the way in design, innovation and craftsmanship in the interior design, home building, hospitality design industry, Designer Drains has built a name for quality products that are manufactured in the USA. As the most overlooked item during bathroom shower remodels, our shower drains offer that final touch of beautiful decor to your bathroom. 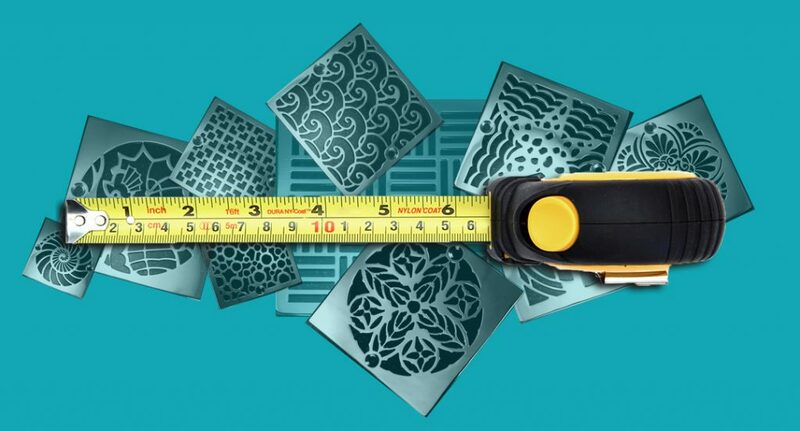 With over 50 designs to choose from you are sure to find the right drain grate that brings the character that suits your bathrooms decor theme. Go ahead, make your neighbors jealous. Shop Now. All of our decorative shower drain covers are made from reclaimed 304 Stainless Steel which means the drain covers will never rust, fade or tarnish. By using only reclaimed stainless steel in our products is our way of assisting the environment, one shower at a time. 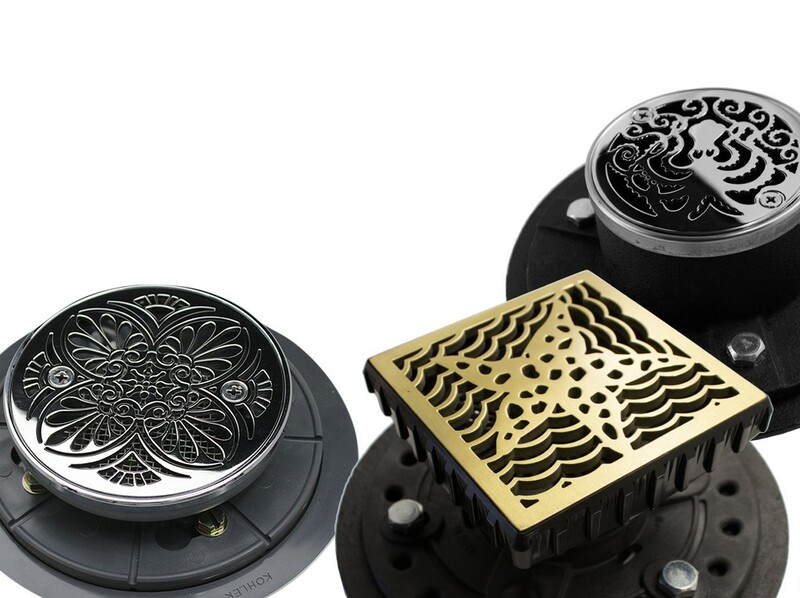 We offer our decorative shower drain covers in a variety of finishes such as polished, brushed, satin brass, copper, chrome, nickel, and even natural weathered finishes. Our decorative shower drain covers can can be used in showers and outdoors make for a quick, easy, and beautiful do it yourself shower remodel. You can find images of the various finishes by clicking here. Along with the various finishes our shower drains are available in, we offer various materials such as bronze, aluminum, steel, brass and stone dependent on what you feel suits your decor best. We are located in beautiful Southern California and are open from 8 am to 3 pm pacific time & understand that figuring out what drain dimensions you have and what is going to work for your shower can be difficult. Call us with any questions at: 888-957-3944 or 909-285-9277 we are more than happy to help you get the correct style and size as we know how crazy and hectic any remodeling can be.